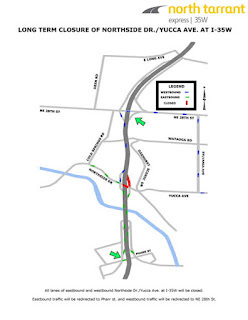 "We just wanted to let you know that North Tarrant Infrastructure will be closing all lanes of eastbound and westbound Northside Dr./Yucca Ave. at I-35W beginning on Sunday, June 4th at 9 pm. This will be a continuous closure through Sunday, July 30th. 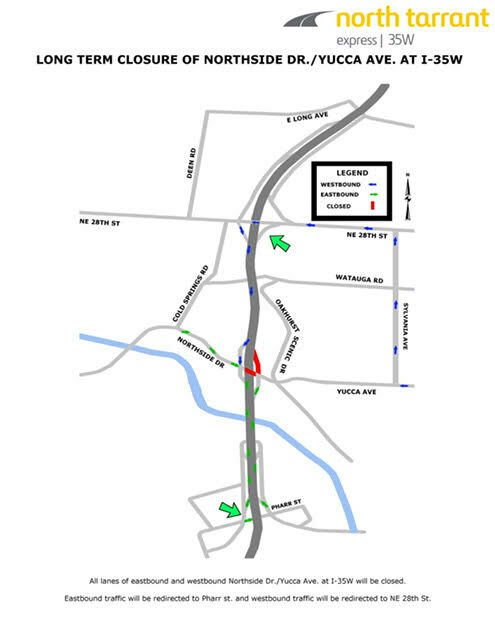 Eastbound traffic will be redirected to Pharr St. and westbound traffic will be redirected to 28th St. Construction teams will work as diligently as possible to expedite the area while reducing the overall impact to the motorists." You may click on the map above to see an enlarged view.